When I’m hungry yet indecisive (98% of my life), I turn to my phone for inspiration. My Instagram feed is predominantly food based, with a few friends in the mix. Of all the people I follow, I get most of my great food ideas from Clerkenwell Boy. His pictures are colourful, delightful and showcase mouth-watering food from all around the world; fortunately mainly London. Working in Clerkenwell – Clerkenwell Boy is almost like an urban legend, and the places his photographs usually gets hoards of people trying to get in for a week after. This is where Padella comes in. 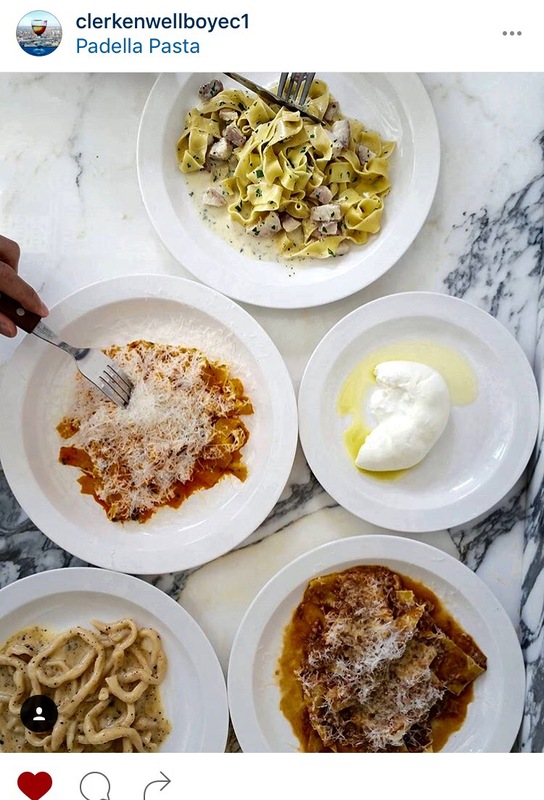 Situated on the edge of Borough Market, looking out on London Bridge tube station (so not very hard to find), this Italian pasta bar takes me right back to some of the authentic dishes I’ve been fortunate enough to try on my travels to Italy. Visiting on a Sunday lunchtime, I was prepared to have to queue for at least 30 minutes, if not more to get a seat. Somehow, miraculously, I walked straight in, forgetting that Borough Market isn’t open on a Sunday so Londoners/tourists may be saving this area for another day of the week. I was seated on a corner bar, the light grey and black marbled bar top shining in the sunlight, my view overlooking Southwark street and the mix of people walking by. Joined by my friend Billie, we instantly ordered a carafe of red wine, and some padella sourdough bread with puglian olive oil. When the wine arrived we thought it looked like a strange sort of juice, but it tasted delicious – that’s probably what wine looks like if you pour it from a tap, but any wine is good for me. The menu was awash with dishes I wanted to sample, so Billie & I decided to order two dishes and try each others. 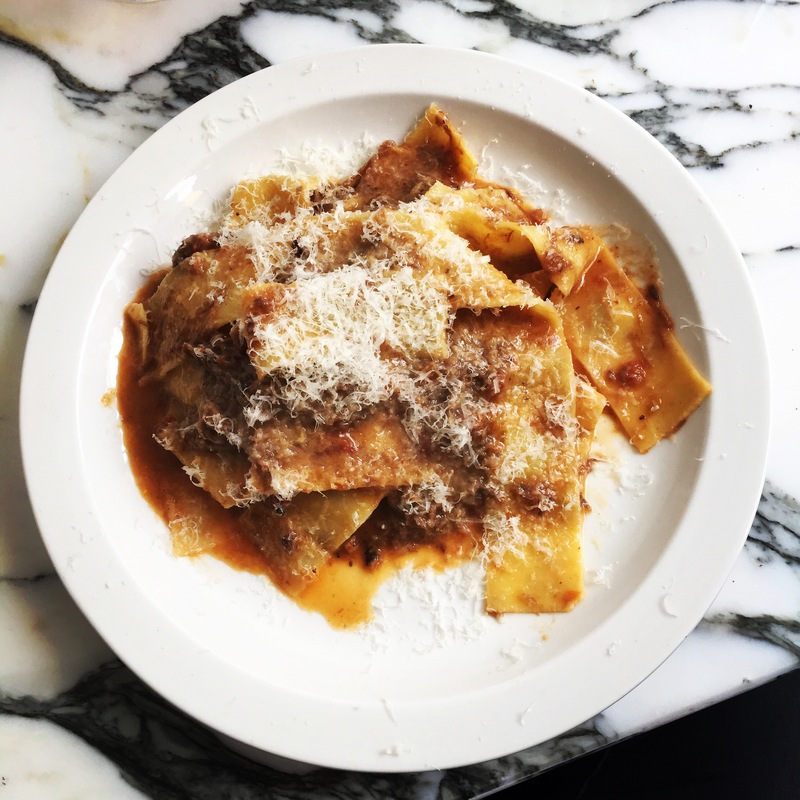 The pappardelle with 8-hour Dexter beef shin ragu has everyone talking, so I couldn’t resist, and she ordered the tagliatelle with nduja and parsley. Nduja is a pretty spicy sausage, so I was relieved when the order came and it was placed in front of Billie, because one mouthful and I was reaching for the (complimentary) sparkling water. For me, any restaurant that serves sparkles for free is somewhere I will happily come back too. The pasta was aldente, the beef tender and the sauce rich and delectable. The earlier sourdough came in incredibly handy once I’d finished all my pasta, and mopped up all my sauce. As I mentioned before, Billie’s was spicy, but the tomato and parsley all combined to make a delicious dish. 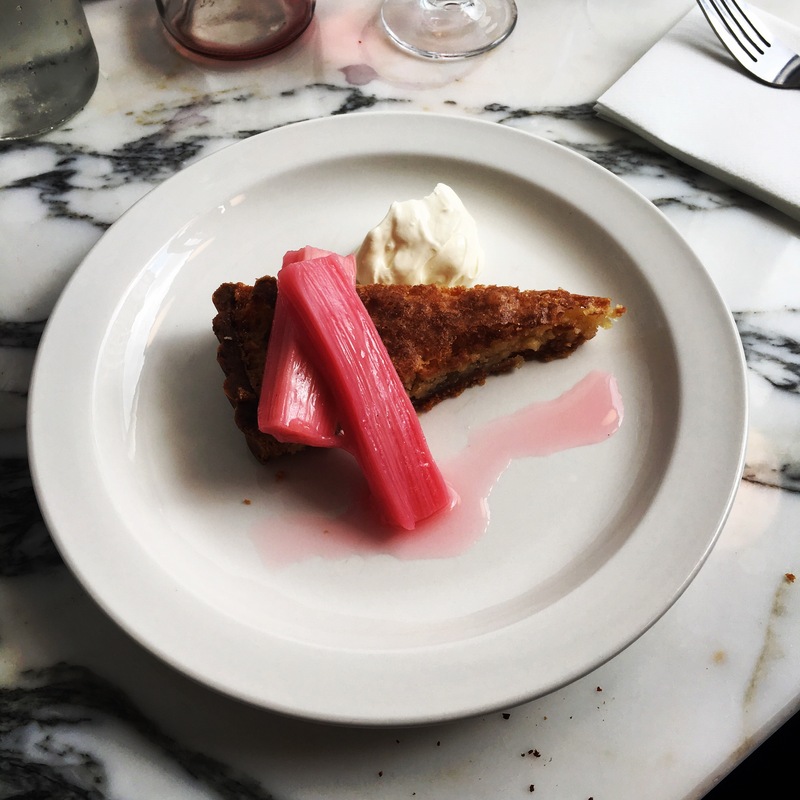 To finish we couldn’t resist ordering the almond & rhubarb tart which an absolute winner, if anything, we should have had one each. 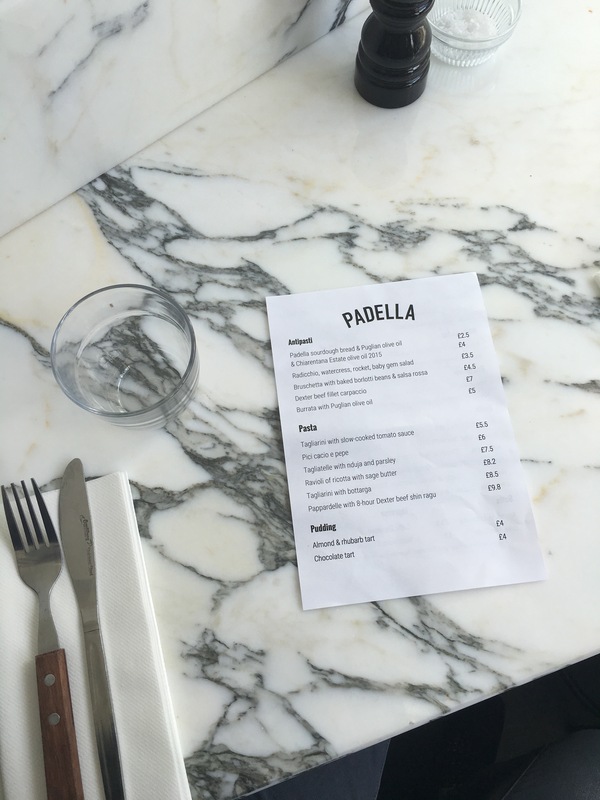 Whether you’re catching up with an old friend, on a first date, or just in need of good old carbs, Padella Pasta is cheap (it cost £20 each for three (ish) courses + 500ml of good Merlot), authentic and a steal for such an amazing location.